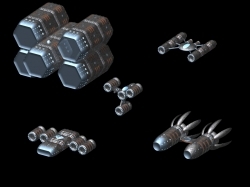 Avian Enterprises, Inc. proudly presents five new playable ships, each uniquely different from each other and with features to set the apart from the vanilla playerships. Feedback (particularly regarding balance) is encouraged! I have Trans1.3 and the AE New Ships Beta, but it crashes when starting the game (before the main menu). "Terrier-class fighter: unknown designtype dcc80efe"
UPDATE #1: I just figured out what the problem was. It’s a thrust effect I put into Core, except I don’t think I replaced Core in the zip file. 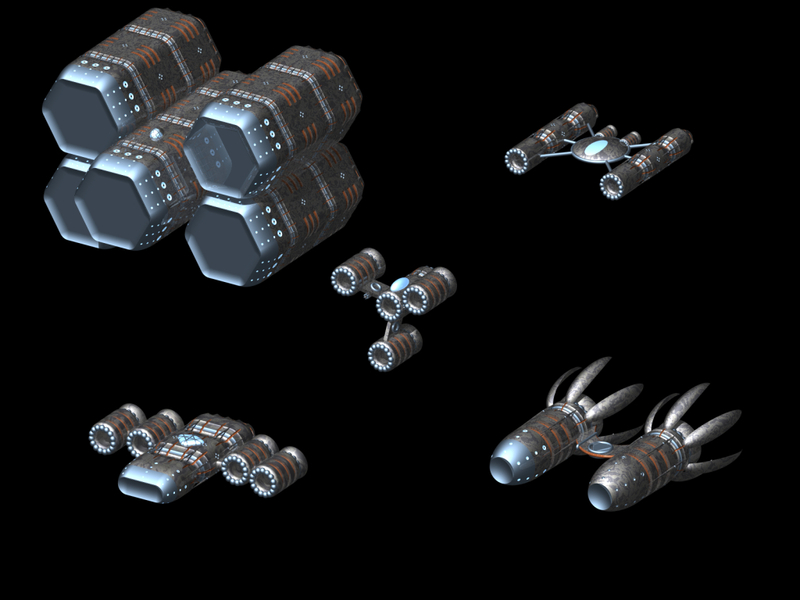 Easy fix, but I’m going to hold off long enough to get a re-render a couple of the ships done. I’ve been tinkering. UPDATE #2: This should be fixed, now. It has been brought to my attention that my last update to this mod apparently broke something (which is weird, since it worked for me just fine until I tried it in a clean install). While I’m not entirely clear on just what the problem actually is, I’m pretty sure that biting the bullet and finally writing a graphics library for all three sub-mods to call on will probably fix it. That’ll happen in the next day or so. Updated at 351 downloads. New sprites on all the playerships (and a new pic to match). The NPC ships all got stripped out and ported over to The Backroads ( https://forums.kronosaur.com/viewtopic.php?f=25&t=6516 ). Also, the graphics are included, so no more external graphics link. Updated at 430 downloads. Ships have been renamed to a more avian theme, in keeping with what was done in The Backroads. No restart should be necessary. Maybe you could make the ships more streamlined such as just having look like big hollow tubes you make sleak looking pods on the sides for rockets and maybe have winged craft such as tri wing with a small rocket on the end or just smaller rocket pods. And larger craft just make like cluster pods with larger exhaust? I mean just closed in the fron on rockets. As for the rear that is up to you. At leas make like some cone sticking out fo the holes and fewer rockets. I am picky I guess. Re-upped at 507 downloads. Besides a few minor UNID changes to make the mod play nicer with TBR, playerships that were made for Eternity Port will now show up in the ship selection screen. Restart required. Re-upped at 535 downloads. Updated the apiVersion so as to let the ships use the newer dockscreens. Also, redesigned the appearance of the Albatross from the ground up. No restart required. Re-upped at 556 downloads. Updated the Albatross to six armor segments. No restart necessary unless your playership is the Albatross. Re-upped at 561 downloads. I fixed something I had forgotten to take out -months- ago as an early experiment with the built-in weapon on the Kingfisher that had it deal generic instead of kinetic damage. Restart required. Re-upped at 563 downloads. Mostly general code tidying on the Gull, including changing its device weight limit to be per-slot instead of just a flat five tons. This will allow you to install both CLAWs and, later on, the APA. Re-upped at 700 downloads. Massive reorganization to everything. All ships now have a new version that starts in the Zyr system, if you have TBR. Also, a lot of low level AE equipment from TBR was copied over, and all versions of all of the ships now use it for their beginning loadouts. Re-upped at 710 downloads. I had forgotten to put one of the AE weapons into the mod when I did the last update. My bad. Re-upped at 711 downloads. There was an issue with the armors that would crash the game on Windows. Many thanks to gunship256 for catching that and working with me to get it fixed. Re-upped at 891 downloads. I thought I had upgraded the Nova-10 the Cormorant starts with, but apparently not. It now begins with a Nova-15. Thanks to Derakon for pointing this one out. Re-upped at 902 downloads. Kingfishers had stopped moving due to having zero thrust, which caused problems with recent beta releases. That has been fixed. I also took the opportunity to streamline a lot of other code. Thanks to Latheos for pointing out the Kingfisher issue, which I had fixed on the NPC version in TBR but had forgotten to fix over here.